Melanged Magic: No! Non! Nein! I drove into Figeac this week to have some photos taken for my visa renewal. The process begins next week and requires 3 head shot photos, one of which will go on my titre de sejour. To reach the photographer's shop, I had to cross over the Cele river on this footbridge. I was appalled to see...love locks! Say it isn't so! 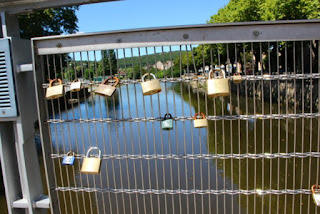 This practice of 'locking your love' to bridge fencing actually began in Rome around 2005 and spread to Paris in 2008. It's been a damaging eyesore ever since. Paris has just recently begun removing bridge panels overloaded with locks which have not only ripped big holes in the fencing, but have also spoiled the magnificent views of the Seine. It's only just begun here, it appears. Please...love locks are not a quaint French tradition. They are a recent form of three-dimensional graffiti. They are ugly and damaging and expensive to remove. If you're coming to France, by all means, bring your lover, but please....leave your locks at home! !